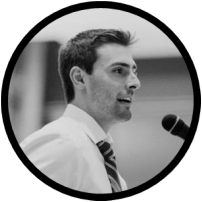 Ryan is our Co-founder and Chief Executive Officer. He is responsible for algorithm development, automated trading, and software infrastructure for all of Bireme's strategies and operations. He also assists with asset allocation decisions. Ryan worked for 7 years at Ballentine Capital, where he developed and deployed algorithmic trading strategies. He graduated in 2009 with a BS in Finance from MIT, where he also captained the hockey and lacrosse teams. Evan is our Co-founder and Chief Investment Officer. He develops firm-wide investment strategy, assists with asset allocation, and performs both bottom-up research and portfolio management for the flagship Fundamental Value strategy. ​Evan worked for 7 years at Ballentine Capital, where he was the lead equity analyst at the value-oriented long/short equity fund. Prior to that he spent 3 years as a professional poker player, where his successes included a 10th place finish at a European Poker Tour event. He graduated in 2007 with a BS in Mechanical Engineering from MIT, where he was a four time All-American in tennis.